About Prof. Denis Larochelle, a biologist at Clark University in Worcester, Mass. 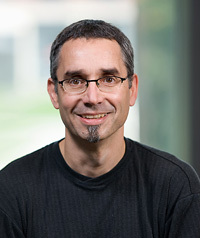 Denis Larochelle joined the biology faculty at Clark University in Worcester, Mass., in 1997. In 2003 he became an associate professor of biology. Prior to his arrival at Clark, he served two postdoctoral fellowships — one in the department of cell biology at Duke University Medical Center, Durham, NC (1994-97) and the other in the department of cancer biology at Stanford University Medical Center, Stanford, CA, and Bowman Gray School of Medicine, Winston-Salem, NC (1991-94). Prof. Larochelle earned his Ph.D. in 1991 from the department of biological sciences at Stanford University. He earned his master's degree (1985) and his bachelor's degree (1983) from the department of zoology at University of New Hampshire, Durham, NH. 2004. Faculty Development Award, Clark University. 2004. Establishment of the Endowed Undergraduate Research Fund in Honor of Denis A. Larochelle. 2002-05. National Science Foundation, "Characterization of a novel regulatory protein required for cytokinesis," $309,028. 2001. Faculty Development Award, Clark University. 2000. National Science Foundation Multi-User Grant, "Microscopy imaging system for Department of Biology at Clark University," $42,454. 1999-02. National Institutes of Health AREA Grant, "The racE pathway in the regulation of cytokinesis," $110,325. 1998. Faculty Development Award, Clark University. 1992. National Cancer Center Postdoctoral Fellowship, Stanford University. 1991. Cancer Biology Training Grant Postdoctoral Fellowship, Stanford University. 1988. Marine Biological Laboratory Scholarship, Woods Hole, MA. 1988. Myers Grant, Stanford University. 1983. Friends of Hopkins Scholarship, Stanford University. 1982. Elected to Phi Beta Kappa. 1982. Harry G. Bickwell Award, University of New Hampshire. 1979-82. Wagner-Hosser Scholarship, University of New Hampshire.